Two years in the making, The Art of Brett Ewins features a candid 11,000 word interview with the creator of such iconic comic strips as Johnny Nemo, Skreemer, and Bad Company, covering his decades long career illustrating such major 2000AD strips as Rogue Trooper, Judge Dredd and Anderson: Psi Division. From his first efforts in the comics business with close friend and drawing partner Brendan McCarthy, with whom he published Sometime Stories, Ewins landed drawing assignments with the then-nascent 2000AD comic. Inside a year he was drawing fill-in episodes the comic's lead strip Judge Dredd, then was handed the long-time gig on Rogue Trooper. By the mid 1980s more Dredd and work on the Dredd spin-off Anderson: Psi Division followed. Again, teaming with McCarthy, Ewins produced two limited series - Strange Days and Johnny Nemo - for American independent publisher Eclipse. Then in the second half of the 1980, Ewins embarked on the operatic Bad Company, working from scripts by his long-time friend and collaborator Pete Milligan. During the early 1990s, while Ewins was illustrating a third series of Bad Company and simultaneously editing the cult monthly Deadline, his health took a turn for the worse and by 1995, he had all but retired from the comics business. The Art of Brett Ewins chronicles all this and more, in Brett's own words, talking frankly about his years in the comics business work and the toll it later took on his health. Illustrated with 49 black-and-white and 70 colour pictures, The Art of Brett Ewins is an 80-page softcover book, price £9.99. Available from Amazon.co.uk, WHSmith.co.uk and other leading online booksellers. 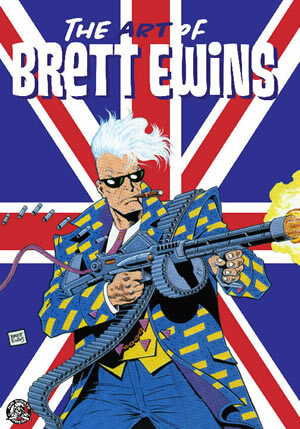 Judge Dredd, Johnny Nemo, Bad Company's Kano, Rogue Trooper, Veto Skreemer ... just some of the characters to pour from the pen-nib of Brett Ewins for comic publishers around the globe, including Marvel Comics, DC Comics and UK's Fleetway. In a frank interview, Ewins talks about his drawing techniques, his work habits and the years of stressful over-production that led to major illness and his early retirement from the harrowing production-line life that is the lot of most professional comic strip artists. And then there's the artwork, mostly shot from the over-sized originals, revealing just how Ewins' pens and brushes created these mini-masterpieces. Included here are inked comic pages, pencil drawings and full-colour paintings. A treasure trove of art, some of it previously unpublished.